Hayes Talisman staff hold their All-Ohio award Monday at Delaware Hayes High School. The staff received the award from the Ohio Scholastic Media Association during their statewide journalism conference last week. Pictured, left to right, are Visual Content Manager Maya Morita, Editor in Chief Emily Metheney and Managing Editor Madeline McGrady. 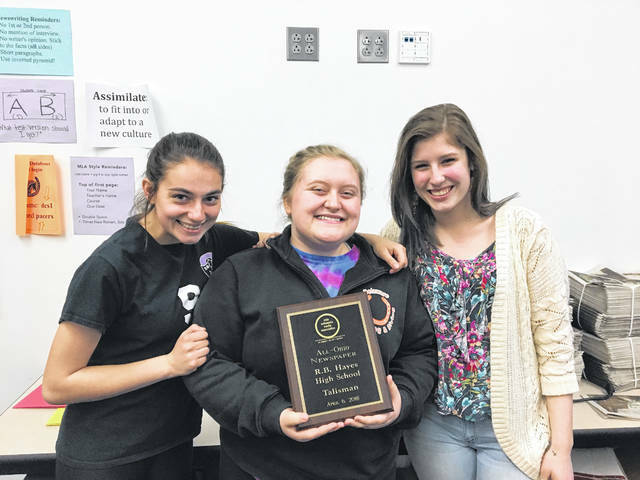 The Hayes Talisman, Hayes High School’s student newspaper, was awarded an “All-Ohio” ranking by the Ohio Scholastic Media Association for their work during the 2017-2018 school year. Three members of the staff and staff advisor Julieanne McClain travelled to Kent State University last week for the Ohio Scholastic Media Association statewide journalism conference, where The Talisman was honored as an “All-Ohio” newspaper, one of only three student newspapers in the state to earn that top recognition, according to McClain. Metheney added they announced the winners in the order of honorable mention, third place, second place, first place and All-Ohio, and she said when they got to first place without mentioning The Talisman, she assumed the newspaper didn’t place in the competition. The Talisman was announced as the “All-Ohio” winner minutes later, to Metheney’s surprise. Maya Morita, a junior and visual content manager for The Talisman, said the award has been a big confidence boost. “We know what we are capable of,” she said. Morita said she joined the paper’s staff last year after taking an intro to journalism course two years ago along with managing editor and fellow junior Madeline McGrady. Morita said she enjoyed working on The Talisman and hopes to study journalism after she graduates. McGrady, a junior, said she hopes to study music after graduation but is considering journalism as a secondary field of study. Metheney, Morita and McGrady said the paper is a “team effort” that wouldn’t work if you removed a single staff member. McClain said she is very proud of The Talisman’s staff because this year’s staff was only about 19 people, a huge decrease from last year’s staff of 40 students. “I’m really, really proud of them and the work they’ve done,” McClain said. She added everyone at Hayes is aware of The Talisman but hopes the awards will bring more attention to the work the staff has done. • Emily Metheney, who received a “Superior” rating in both the Personality Profile and News Feature categories. • Alex Whited who received a “Superior” rating in the Column category. • Ethan Watts who received a “Superior” rating in the Sports Opinion category. • Kaitlyn Finchler who received a “Superior” rating in the Photo Story category. • Maya Morita & Emily Scheib who received a “Superior” rating in the Photo Illustration category. This entry was tagged delaware hayes high school. Bookmark the permalink.